Cows and Krishna have always been together. 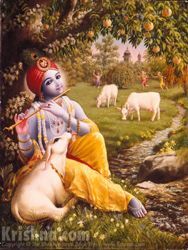 In His original form in the spiritual world, Krishna is a cowherd boy in the agricultural community of Goloka ("cow planet") Vrindavan, where He keeps unlimited, transcendental surabhi cows. When He descends to earth, Krishna brings a replica of Vrindavan with Him, and He spends His childhood tending cows and calves while playing in the pasturing grounds with His friends. His example shows the importance of cows to human society, the practical benefits of caring for them, and the advantages of an agrarian economy based on cooperation between man and cows. Krishna established the original economic system, varnashrama-dharma, for the spiritual and material progress of all living beings. Protected cows are a major component of this system; bulls and oxen till the fields, and cows give milk. Cows are are considered one of the mothers of humankind because cow's milk—when properly prepared—is perfectly suited to maintaining human life. Milk can be made into a wide variety of preparations, such as yogurt and butter, which are also essential ingredients for use in the ceremonial worship of Krishna in His transcendental Deity form. In His famous book of instructions for humankind, the Bhagavad-gita, Krishna mentions cow protection as one of the prime duties of any civilized society. The Bible also tells us that cow-killing is as punishable as killing a human being. Note: our homepage banner photo for Cows and Krishna comes courtesy of the International Society for Cow Protection. - a modern-day attempt to live up to an ancient ideal. - If we all want peace, why is there war? Because nature doesn't tolerate animal slaughter. - a collection of articles based on the idea of cow protection and agrarian economy. - why the Vedas recommend we serve, protect, and worship cows, and some practical ways we can do so today. - If Krishna Himself created the ideal, nonviolent economic system—based on cow protection—why has cow slaughter become so prominent over the last few centuries? "I worship Govinda [Krishna], the primeval Lord, the first progenitor who is tending the cows, yielding all desire, in abodes built with spiritual gems, surrounded by millions of purpose trees, always served with great reverence and affection by hundreds of thousands of lakshmis or gopis." "My Lord, You are the well-wisher of the cows and the brahmanas, and You are the well-wisher of the entire human society and world." "Farming, cow protection and business are the natural work for the vaishyas [the worldwide economic community]." "The highest glorious association with the Lord is made possible in the planet of Goloka Vrindavana, where Lord Krishna enjoys Himself with the gopis and His favorite animals, the surabhi cows. A description of this transcendental land of Krishna is given in the Brahma-samhita, which is considered by Lord Sri Chaitanya to be the most authentic literature in this connection." "Milk is compared to nectar, which one can drink to become immortal. Of course, simply drinking milk will not make one immortal, but it can increase the duration of one's life. In modern civilization, men do not think milk to be important, and therefore they do not live very long. Although in this age men can live up to one hundred years, their duration of life is reduced because they do not drink large quantities of milk. This is a sign of Kali-yuga. In Kali-yuga, instead of drinking milk, people prefer to slaughter an animal and eat its flesh. The Supreme Personality of Godhead, in His instructions of Bhagavad-gita, advises go-rakshya, which means cow protection. The cow should be protected, milk should be drawn from the cows, and this milk should be prepared in various ways. One should take ample milk, and thus one can prolong one's life, develop his brain, execute devotional service, and ultimately attain the favor of the Supreme Personality of Godhead. As it is essential to get food grains and water by digging the earth, it is also essential to give protection to the cows and take nectarean milk from their milk bags." "The cow is the most important animal for developing the human body to perfection. The body can be maintained by any kind of foodstuff, but cow's milk is particularly essential for developing the finer tissues of the human brain so that one can understand the intricacies of transcendental knowledge. A civilized man is expected to live on foodstuffs comprising fruits, vegetables, grains, sugar and milk. The bull helps in the agricultural process of producing grain, etc., and thus in one sense the bull is the father of humankind, whereas the cow is the mother, for she supplies milk to human society. A civilized man is therefore expected to give all protection to the bulls and cows." "Pancha-gavya, the five products received from the cow, namely milk, yogurt, ghee, cow dung and cow urine, are required in all ritualistic ceremonies performed according to the Vedic directions. Cow urine and cow dung are uncontaminated, and since even the urine and dung of a cow are important, we can just imagine how important this animal is for human civilization. Therefore the Supreme Personality of Godhead, Krishna, directly advocates go-rakshya, the protection of cows." Should ISKCON make dairy products from protected cows commercially available? Considering the current state of affairs, shouldn't veganism be encouraged?